Intercollegiate athletics programs that play full schedules in front of big crowds in fancy arenas are a fact of life for college women athletes today. It’s a far cry from when college sports teams for women meant recruiting their own players and even coaching themselves. The landscape has changed radically since the 1972 Education Amendment and the 1979 Title IX policy interpretation specific to gender equality in intercollegiate athletics — so much so that students today would no doubt consider the athletic options for women just two generations ago incomprehensible. With no formal “varsity” athletics program during the post-World War II/pre-Title IX years, women at Grinnell relied on their tenacity and resourcefulness, the skills they brought to college with them, or all of the above. Intramurals, extracurricular recreation, and club teams were the main outlets for satisfying the competitive urge. Then there were the physical education requirements. Dreaded by some, easy for others, curricular P.E. demands for both women and men were meant to promote lifelong well-being. Or else. Not getting a diploma because you couldn’t swim or do sit-ups was a legitimate fear in the 1950s and ’60s. Either way, we might deduce that many women of the era were cheerfully practical about graduation requirements, including those that involved physical fitness. Certainly the athletically inclined wrung every drop out of whatever recreational opportunities they found or created. Still, it seems fair to ask if at least some female students of the day didn’t openly regard the “athletic program” as unfair or deficient. Not so busy that she didn’t make time to play field hockey and volleyball and participate in White Caps synchronized swimming. But Budlong’s perspective on athletics had been shaped by widely divergent experiences earlier in her life. At Grinnell, Budlong says, “Women were getting antsy in terms of revolting against things like women’s hours, which were pretty severe, and the rules being different socially for women than for men. But [they weren’t] going around worrying if the athletics program was adequate. Connie Sloop Archea ’67 brought considerable skill to White Caps after competing on a swim team and lifeguarding prior to college. She admits that the extracurricular activity was a bit of a “consolation prize” compared to competitive swimming. “I’m not sure synchronized swimming was even considered a sport at that time,” Archea says. “It certainly was not an Olympic event. We would have laughed at the idea. Still, I had fun doing it. The lack of a formal stage for women’s sports didn’t prevent the men’s coaches from appreciating athleticism when they saw it. When men’s swimming coach Irv Simone noticed Archea in the pool, he directed his team’s attention to what she was doing. “He told them to watch my freestyle stroke because that’s what it should look like,” Archea says. Beadle competed as an individual in two Midwest invitationals for college women. 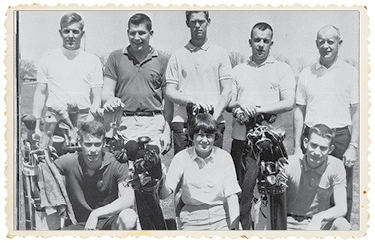 “In 1964 it was at the University of Minnesota golf course, and I drove up with a P.E. professor to play it,” Beadle says. “She wouldn’t let me drive up there on my own. In loco parentis ruled and women were locked up in the dorms at midnight. 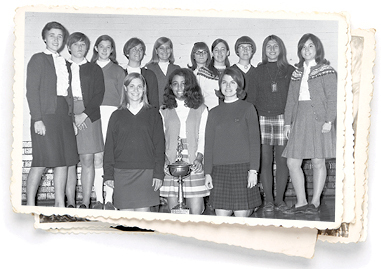 Intramural sports, which were run by the Women’s Recreation Association, had a profound effect on the lifestyles of students like Mary Albrecht Cowan ’59 and Irene Blaser Elliott ’67. “Intramurals royally supplemented my academic work with unlimited opportunities for movement, learning, leadership, and competitive/cooperative experiences, all basic to who I am,” Cowan says. “That was true at Grinnell; it was true throughout my career as an academic administrator/physical educator and now in retirement when I’m almost as active as pre-retirement. Elliott brought ballet skills to college and says she became “keen on the dance intramurals.” Those interests led to experiences in choreography, theatre, and elementary education. She still dances with an amateur ballet company. Other Grinnellians who may well have pursued varsity competition given the opportunity still see the physical education requirements as a sound plan with a worthwhile purpose. “The four years I attended Grinnell the emphasis was on lifelong learning,” says Leanne Hoepner Puglielli ’66. “I loved to swim so [the swimming test] was not an issue for me, but lifelong learning also meant a healthy weight — I had to lose 20 pounds. In addition to requirements everyone had to meet, the P.E. requirement included a major sport, a minor sport, and a team sport. Majors and minors were supposed to be sports we could continue throughout life. The team sport was just that — it taught us how to work as a contributing member of a team. “You had to meet the criteria whether it took you one semester or four years,” Puglielli says. “There were folks who weren’t sure they were going to graduate because they couldn’t make it across the pool. Cindy Maier ’70 strongly endorses the P.E. concept. “I actually have raved for 40 years about Grinnell’s gym requirement when we were there,” Maier says. “It was the best, most thought-through athletic requirement I’d ever heard of even to this day. It truly was your well-rounded liberal arts experience. “The physical fitness requirement was pretty basic for those of us who were athletic, but the requirement for a carry-over sport you could do as an individual after graduation was really astute,” Maier says. “They were clever enough to know that someone like me that had done a lot of sports could qualify out of my individual carry-over so they didn’t even worry about me. “But someone who had done nothing in high school — and in our day, women could very easily do almost nothing in high school — didn’t have to have ability. They just had to complete those four quarters and learn how to do any one or multiple sports,” Maier says. Maier credits the Grinnell P.E. staff for going the extra mile to support women athletes who wanted to compete at a higher level, even when the athletes’ skills outpaced the coaches’ expertise. “There were three of us from Philadelphia who’d played field hockey in high school,” Maier says. “We didn’t want to give it up so we recruited our friends. We got enough people to make a team, and we taught them how to play. “We did play against other colleges, and the P.E. staff made all the arrangements,” Maier says. “They made it happen. It was very informal, but we did have a year when we played in the Iowa state championship at University of Northern Iowa, and we won! Pioneer Women’s Weekend: A Celebration of the Lost Generation of Grinnell Athletes will be held on campus April 21–22, 2017. See alumni.grinnell.edu/pioneerwomen. Regardless of whether they considered themselves athletes, Grinnell alums are encouraged to join in and honor Grinnell’s true Pioneers who played for the love of the game. For the latest programming details, contact the Office of Development and Alumni Relations at 866-850-1846.